Never before did I have my fingers so tightly crossed like the time I did when I started making these parottas. The outcome was such a joy to watch and to eat. Always thought Kerala Parotta was something meant to be ordered from restaurants till the time I decided to prepare it. It is very very easy to prepare but get ready to drench in oil. Lots of oil is used in preparing the parotta but it is so worth those flaky layers and the super soft and tasty parotta. 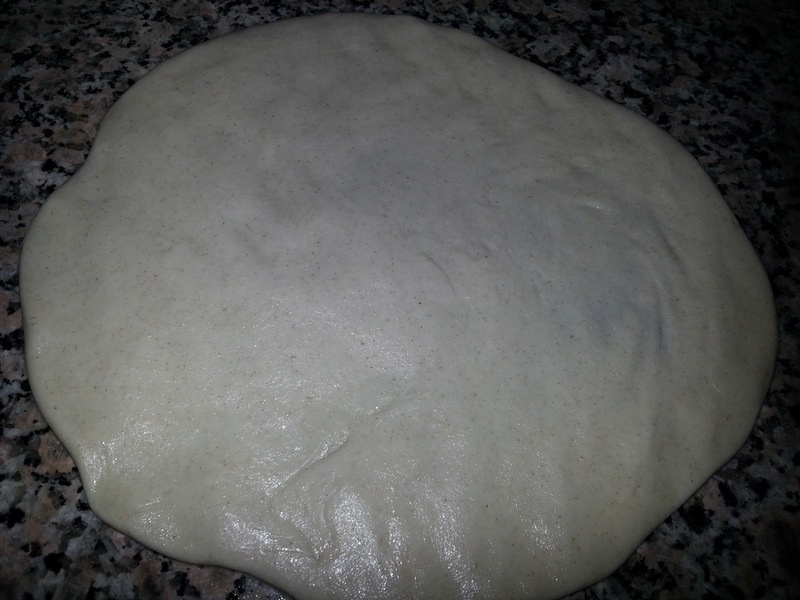 The dough needs to be kneaded soft and very well, the dough needs to be rested well and you need use oil generously. These are the absolute necessary steps. 1. First clean a work surface. You cannot make kerala parotta without a large work surface. You cannot make it on just the rolling board. 2. In a mixing bowl or directly on the cleaned work surface sieve the all purpose flour. Add salt and mix well. 3. 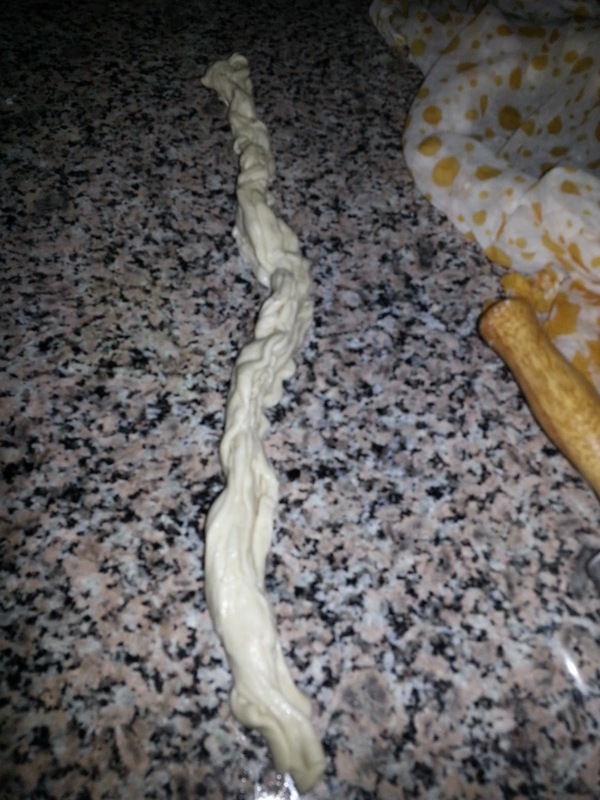 Add water little by little and knead a very very soft dough. It should almost stick to your hands. 4. Knead it for about 8 minutes. Cover it with a damp cloth and leave it to rest for about 10 minutes. 5. 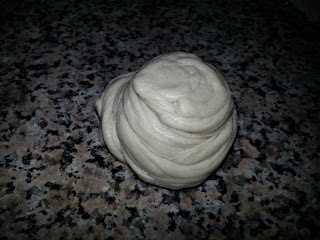 Knead the rested dough once again for about 3 minutes. Cover and let it rest again for about 5-10 minutes. 6. 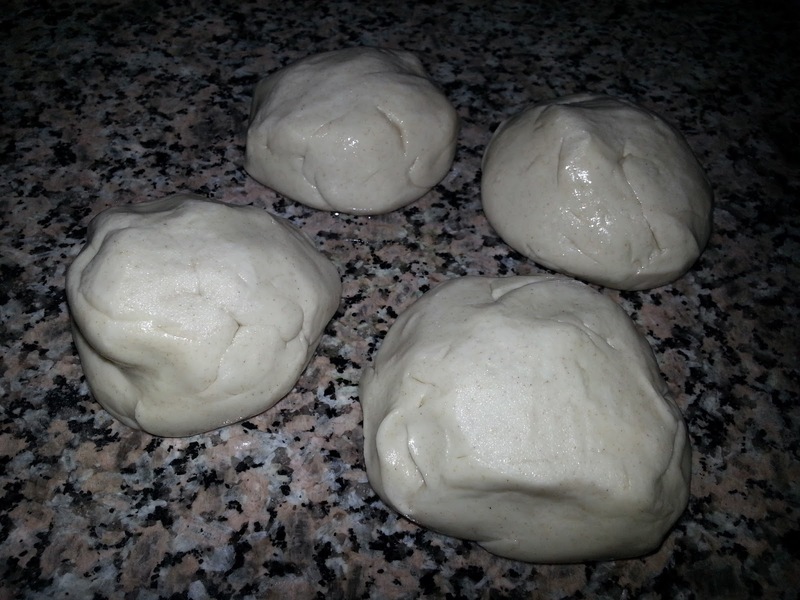 Apply oil on both your palms and fingers and divide the dough into portions. Roll them tight into a ball and apply oil all over them. Cover and keep them to rest for another 5-10 minutes. 7. 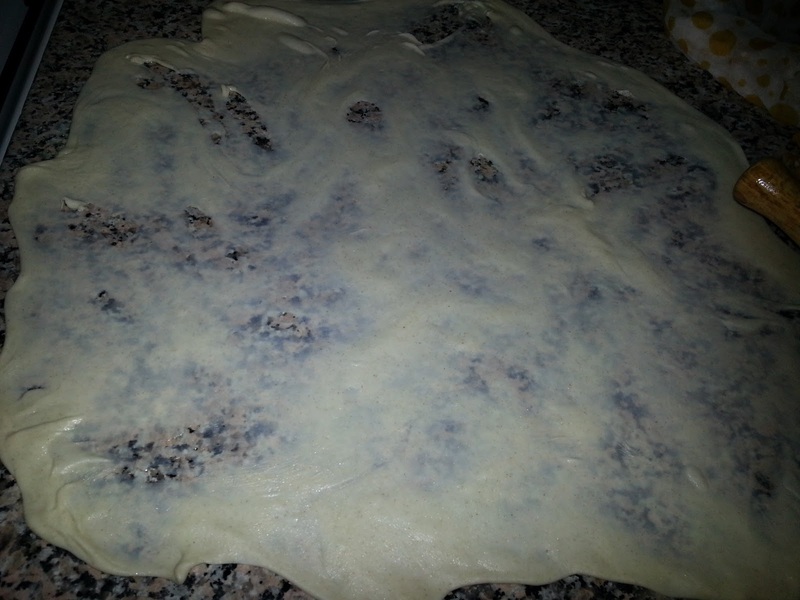 Take one dough ball at a time leaving the rest covered. 8. Pour some oil on the work surface and spread it out. 9. Now spread the dough ball on the oiled work surface with your fingers and then either roll it thin on all sides with a rolling pin or flip it with your hands or just continue to spread with your fingers till it is almost transparent. 10. If it tears its ok. Mine tore really bad. 11. Apply oil on the top surface of the dough and dust it with very little all purpose flour. 12. Lift one of the long corners, move it forward and place it down like pleating. Repeat this till you reach the other end. 13. You may now hold both the corners and swing it in the air like a rope. 14. 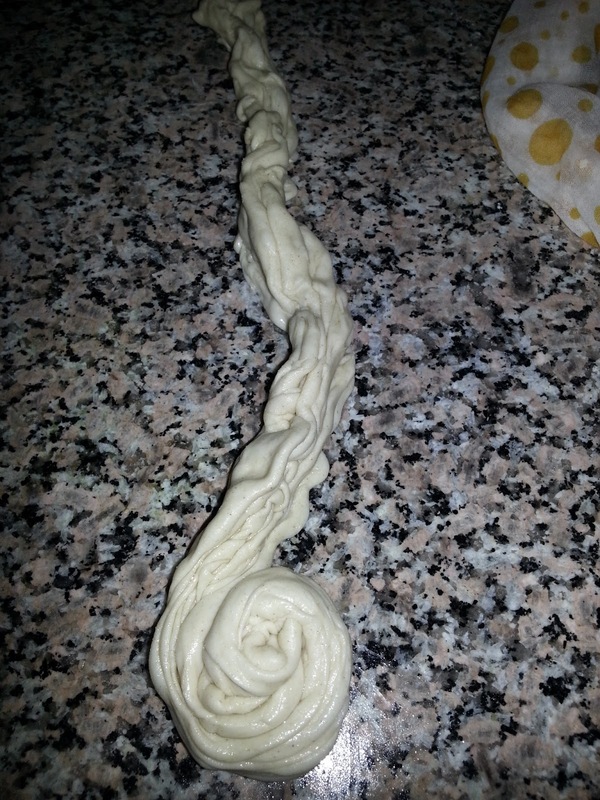 Place it back on the work surface and start rolling it around keeping the layers on top. 15. Tuck the end below the rolled out dough. Keep it covered for 10 minutes. 16. Repeat the steps with the remaining dough balls. 17. Pour some oil on the work surface and spread it. 18. 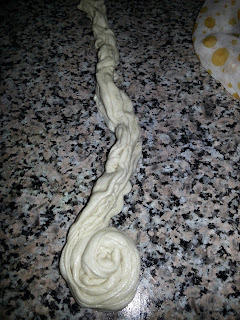 Take one of the rolled dough and gently spread it in to a disc using a rolling pin. Do not make it too thin. 19. Heat a tawa, it has to be very hot. 20. Place the parotta on the hot tawa and cook it. 21. When bubbles start to form, flip it to the other side. You will find brown spots. 22. Apply oil and flip it again. Apply oil on that side too. 23. 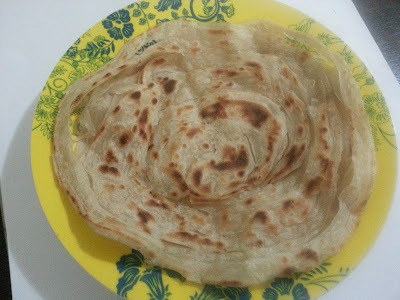 Cook the parotta by flipping it from side to side till it is done. 24. 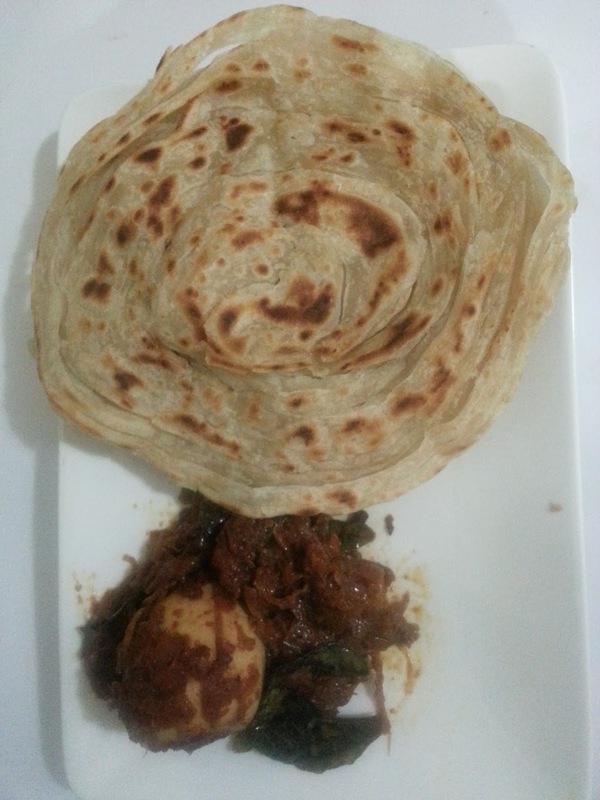 Remove the parotta to a plate. Using both your hands crush the parotta to separate the layers. 25. Cook the remaining parottas in the same way. Serve them hot.